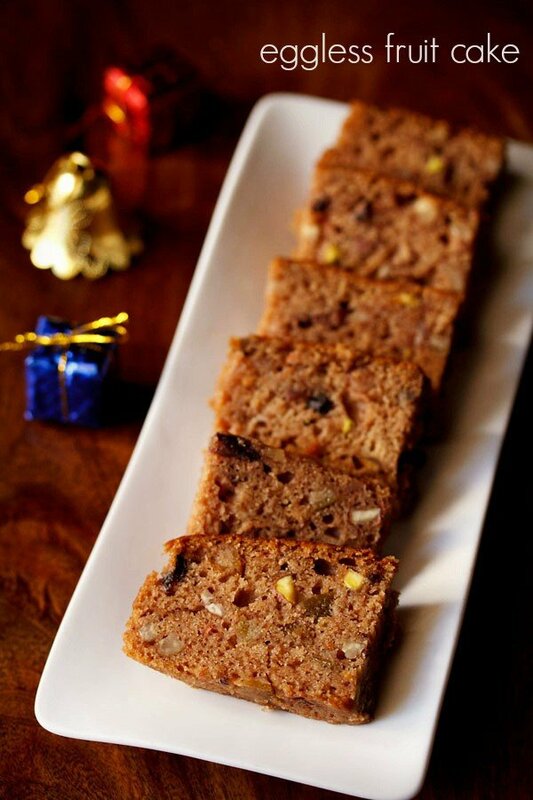 one easy and tasty recipe for making a kerala christmas fruit cake without eggs and alcohol. in the recipe apple juice is used instead of alcohol. 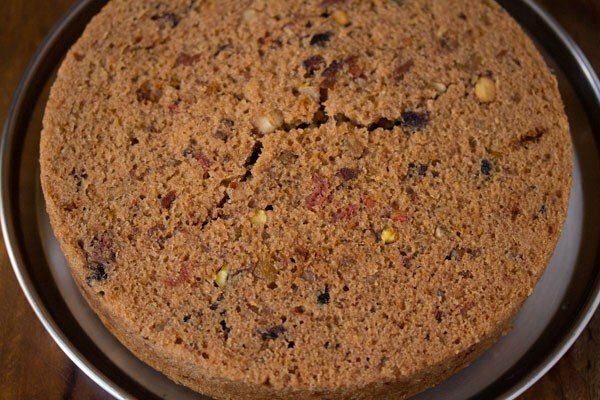 kerala plum cake recipe with step by step photos. 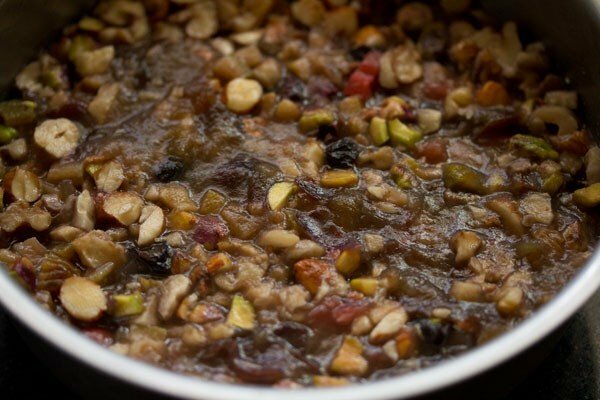 one easy and tasty recipe for making a kerala christmas fruit cake without eggs and alcohol. we love fruit cakes. 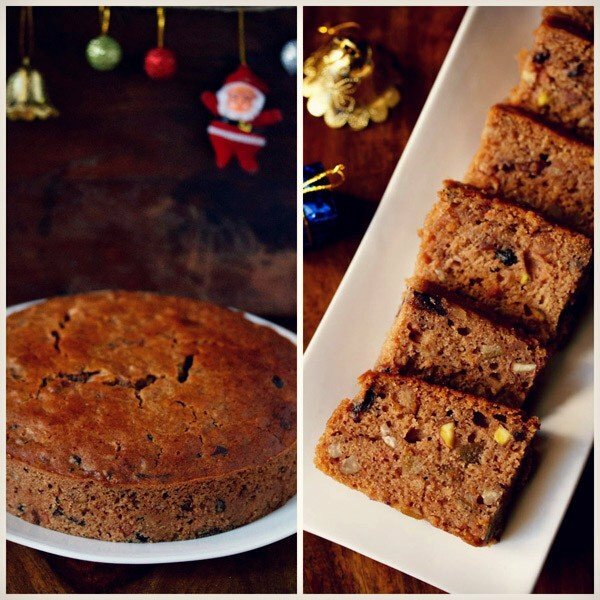 so no wonder, i already have two eggless fruit cakes posted on the blog – eggless wine fruit cake and eggless christmas fruit cake. this year i wanted to share an eggless version of a kerala style plum cake. 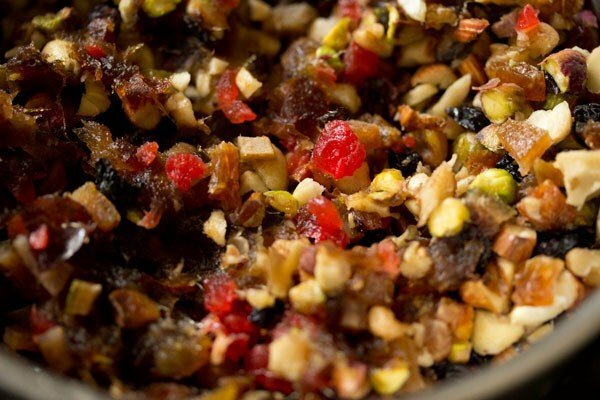 one major difference in this and the other fruit cake recipes, is the addition of caramel. this does give a nice brown color to the cake. 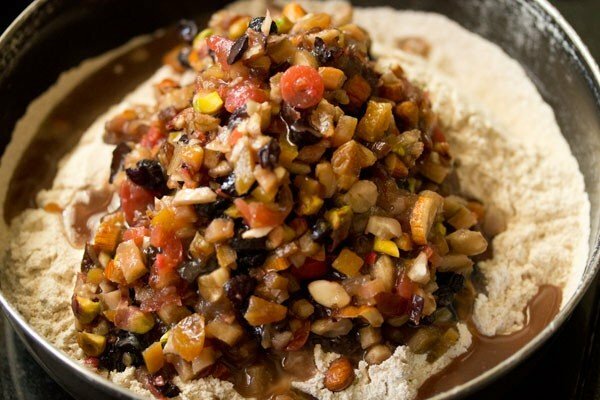 this fruit cake recipe is made without alcohol. i have made this cake both with fresh orange juice and apple juice on various occasions. 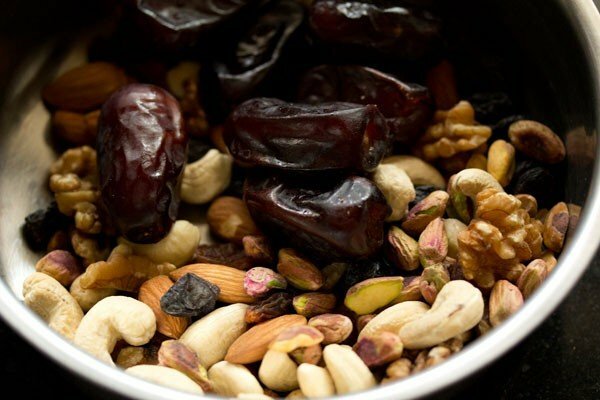 soak the dry fruits in either of the juice overnight in the fridge. with orange juice, you need not worry as the cake does not become bitter. 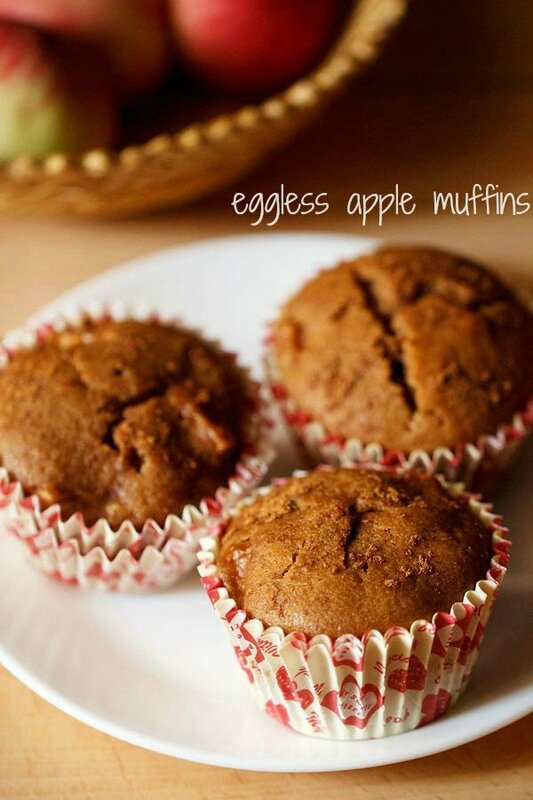 i have used organic apple juice and 100% whole wheat flour (atta) in the recipe. so this is a healthy bake. the amount of sugar and oil added is also not too much. 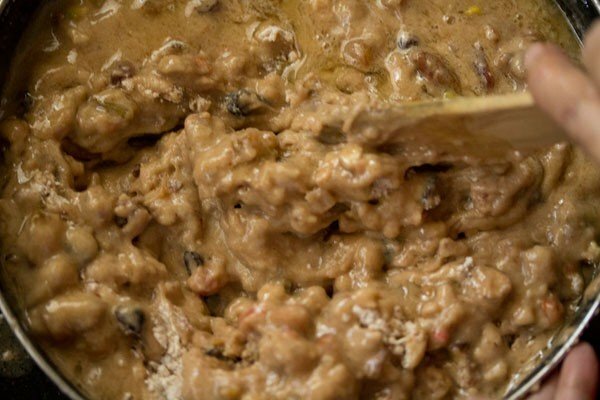 the sweetness of the dates, golden raisins and black currants used in the recipe, compensates for less sugar being added. to make the caramel syrup for this kerala plum cake, i did check the method on nag’s blog. preparing the caramel is not difficult. so don’t worry on that. just cook the sugar+water on a low flame and keep on stirring often. 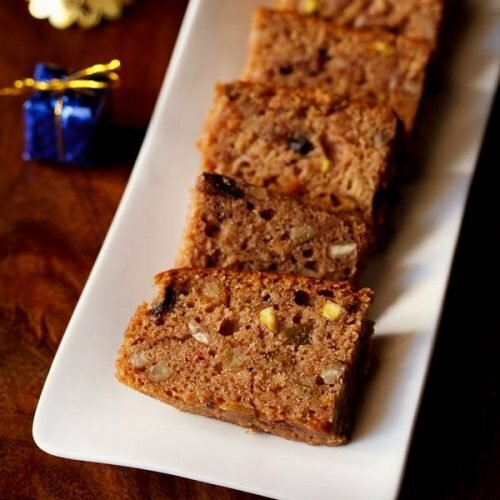 this fruit cake is soft, moist and crumbly. the recipe yields about 1 kg of fruit cake. i have used a 8 inch round pan. though you can even use a loaf pan with 8.5 x 4.5 x 2.5 dimensions. do use dry fruits of your choice, but do not skip on the candied orange peels. these give lovely bitter notes in some bites while savoring the fruit cake. 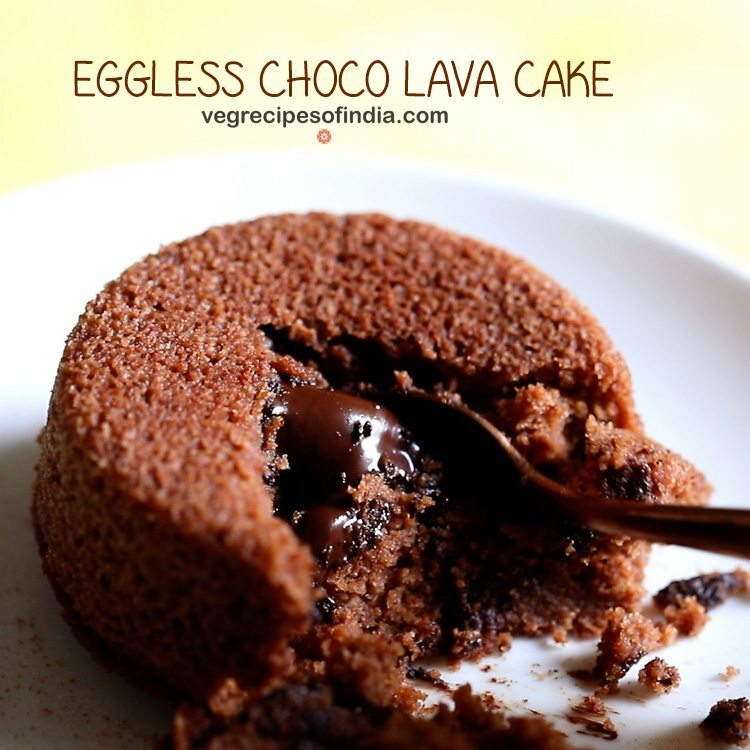 if you are looking for eggless cakes recipes then do check sponge cake, black forest cake, pound cake, mawa cake, banana cake and basic eggless chocolate cake recipe. take all the dry fruits and nuts in a bowl. i just rinse them once or twice and then drain them very well. if you want you can rinse them. now finely chop all of them and collect in a mixing bowl. add the apple juice and mix very well. allow the fruits to soak in the apple juice for a day. keep covered in the fridge. 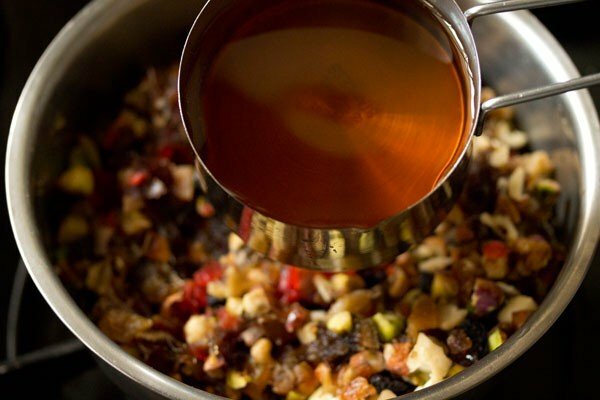 bring the dry fruits + apple juice mixture to room temperature before you proceed with the recipe. in a sauce pan, take 1/2 cup sugar (100 grams) and 2 tbsp water. mix and stir very well. keep this pan on the stove top on a low flame. i used organic unrefined cane sugar. bring this sugar solution to a boil on a low flame. you will see the mixture bubbling initially. continue to cook and do keep on stirring often. at one point it might look that the sugar is getting crystallized. continue to cook and stir frequently till you see the color changing to a dark brown. switch off at this point. remove the pan from the stove top and place it down. immediately add 1 cup water to the caramel. be careful while doing so, as the mixture splutters. the caramel will harden as soon as you pour the water. keep the saucepan back on the stove top on a low flame. 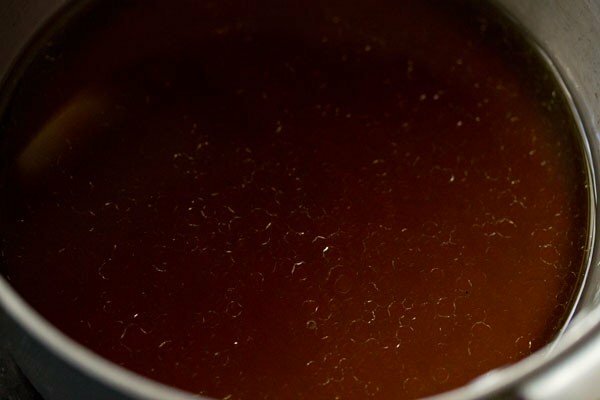 stir often and bring to a gentle simmer till all the hardened caramel is dissolved. do stir often so as to aid in dissolving the caramel. 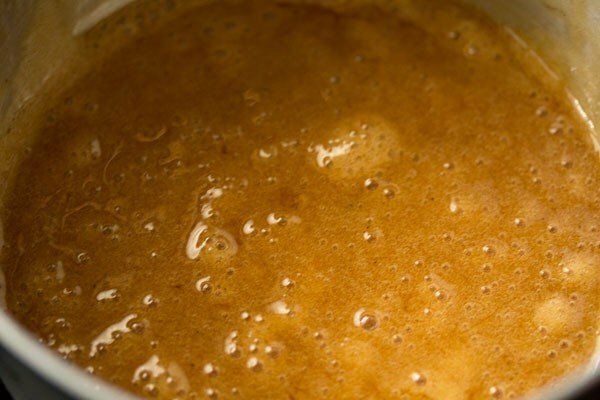 let this caramel solution cool completely. 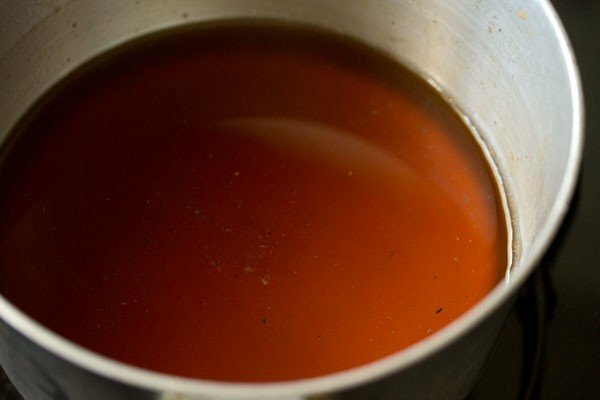 once the caramel has cooled down, add 1/3 cup oil. i used olive oil. you can also use sunflower oil or melted butter. 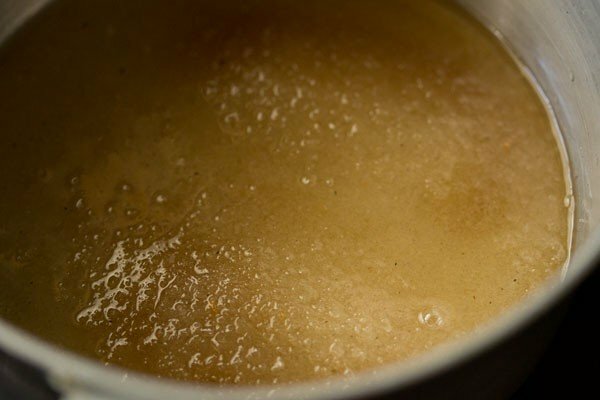 if using melted butter than add it when the caramel solution turns warm. mix the oil with the caramel solution very well. next add 1.5 tbsp lemon juice or apple cider vinegar. i used lemon juice. you can also use regular white vinegar. mix again very well. 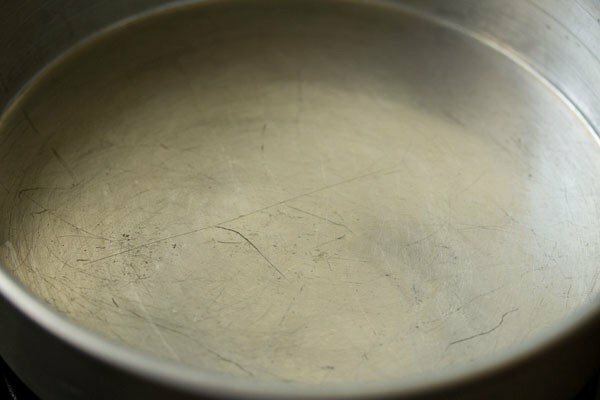 grease a 8 inch round pan very well with oil or butter. also preheat the oven at 180 degrees celsius before 15 mins you bake. 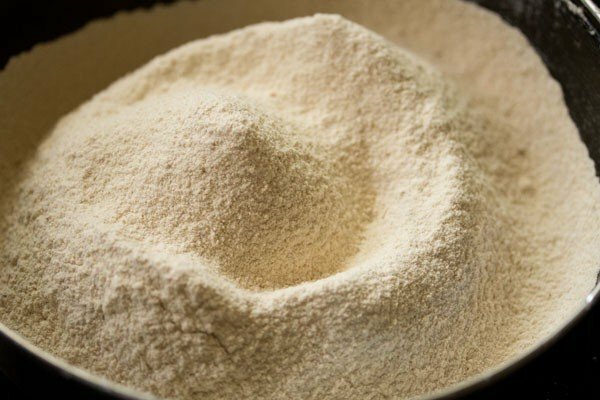 in a seive, take 2 cups whole wheat flour/atta (240 grams), 1 tsp baking soda, 1/2 tsp baking powder, 1/4 tsp cinnamon powder, 1/4 tsp nutmeg powder, ⅛ tsp clove powder and 1/2 tsp cardamom powder (optional). next add the soaked dry fruits + apple juice mixture to the sifted dry ingredients. with a spatula just mix lightly. now fold the flour ingredients with the caramel solution to a smooth batter. 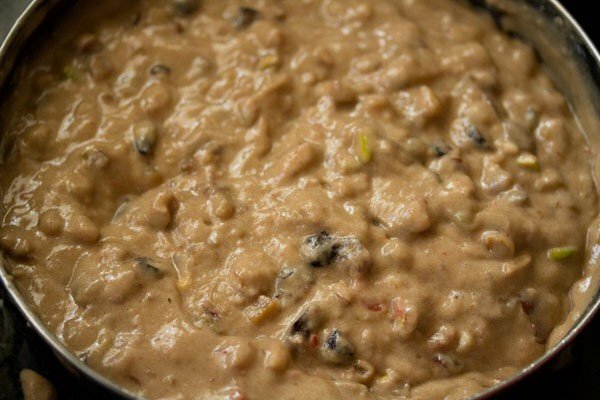 pour the batter in a prepared pan. gently shake and tap the pan so as to even out the batter. place the pan in a preheated oven and bake the cake at 180 degrees celsius for 1 hour or 1 hour:15 minutes. the tooth pick should come out clean and dry when inserted in the cake. this cake has to be baked very well. if the top gets browned too much, then cover with an aluminium foil and bake. baking time varies with various brands and models of oven. you can sift some powdered sugar on top of the cake to hide the cracks on the top. slice and serve the cake. the cake can also be refrigerated. it keeps good for 10 to 12 days in the fridge. sliced the cake in slices and stored the slices in an airtight box. 1. take all the dry fruits and nuts in a bowl. i just rinse them once or twice and then drain them very well. if you want you can rinse them. 2. now finely chop all of them and collect in a mixing bowl. 3. add the apple juice. 4. mix very well. allow the fruits to soak in the apple juice for a day. keep covered in the fridge. 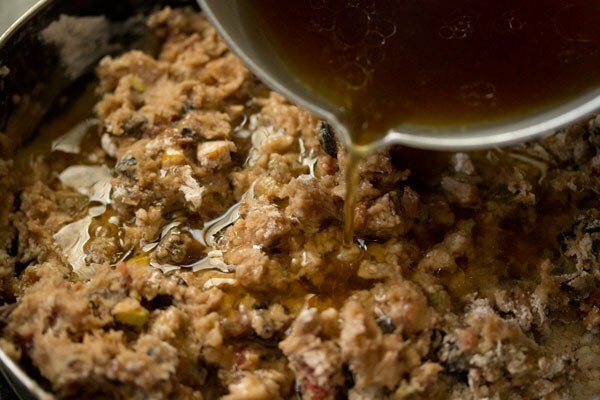 5. this is the dry fruits + apple juice mixture the next day. bring this to room temperature before you proceed with the recipe. 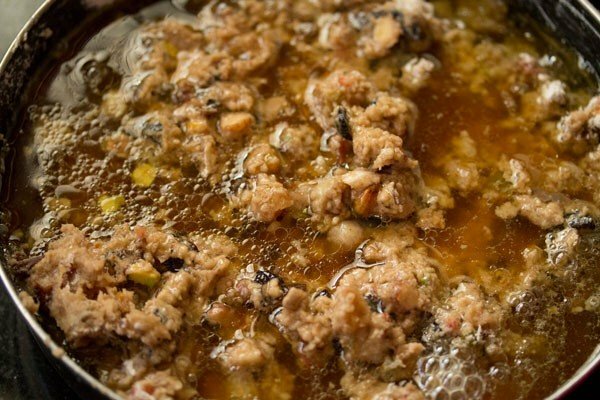 6. in a sauce pan, take ½ cup sugar (100 grams) and 2 tbsp water. 7. mix and stir very well. keep this pan on the stove top on a low flame. i used organic unrefined cane sugar. 8. bring this sugar solution to a boil on a low flame. you will see the mixture bubbling initially. 9. continue to cook and do keep on stirring often. 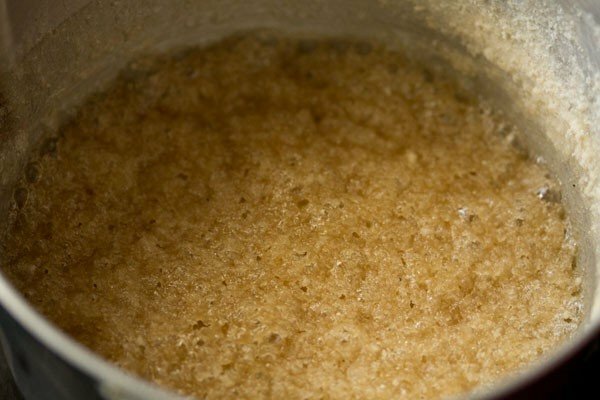 10. at one point it might look that the sugar is getting crystallized. 11. continue to cook and stir frequently. 12. the pale brown color is still there. 13. continue to cook and stir and you will see the color changing to a dark brown. 14. here the caramelization process has started. since i was also handling the camera, i stopped here fearing that the caramel should not get burnt. 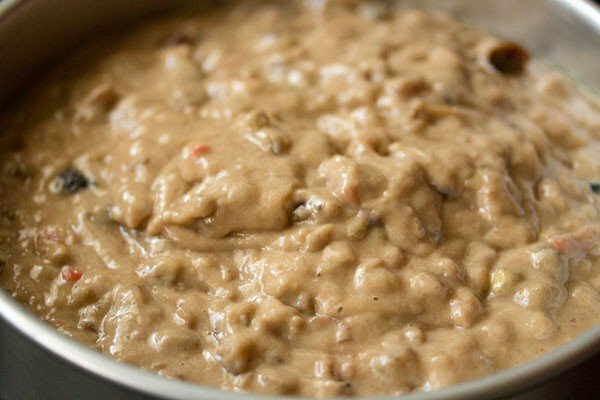 the color should become a little more brown and you will also get the caramel aroma. 15. remove the pan from the stove top and place it down. immediately add 1 cup water to the caramel. be careful while doing so as the mixture splutters. 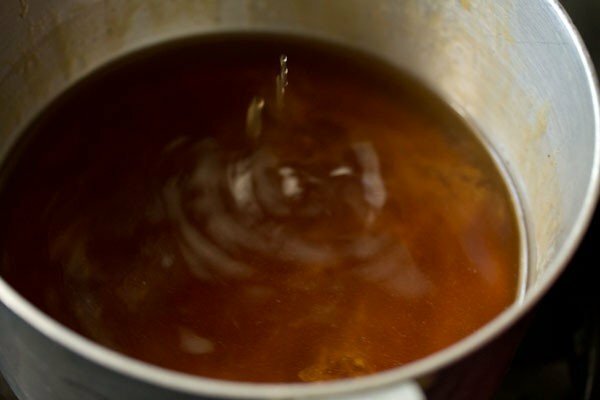 16. the caramel will harden as soon as you pour the water. keep the saucepan back on the stove top on a low flame. 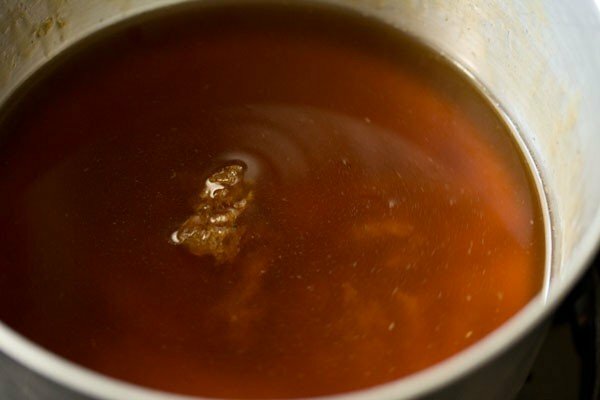 stir often and bring to a gentle simmer till all the hardened caramel is dissolved. 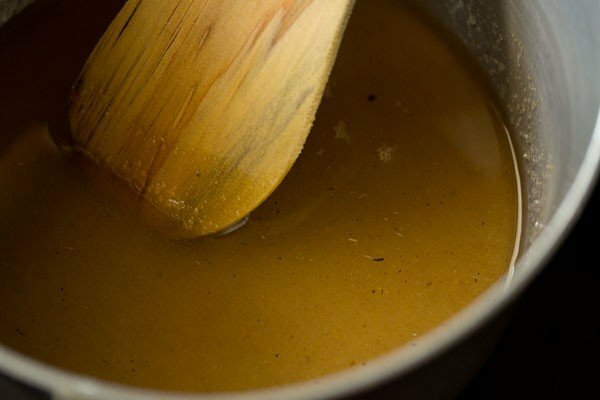 do stir often so as to aid in dissolving the caramel. 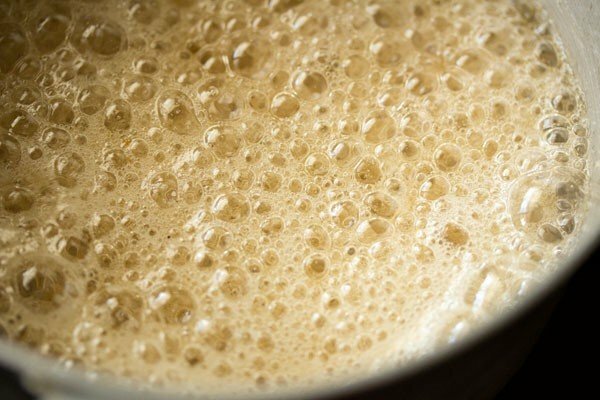 17. below is the caramel liquid. 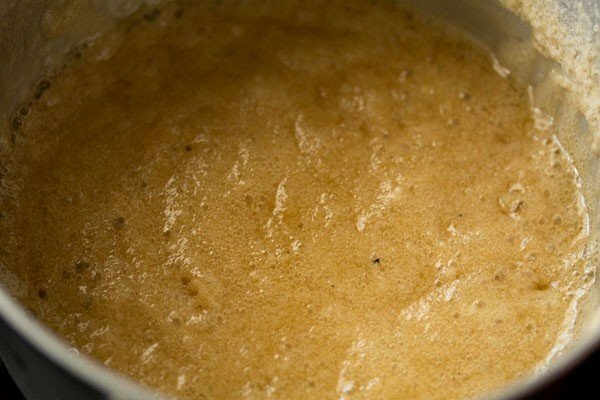 let this caramel solution cool completely. filter this solution and keep aside. you can see the impurities from the unrefined sugar in the picture below. 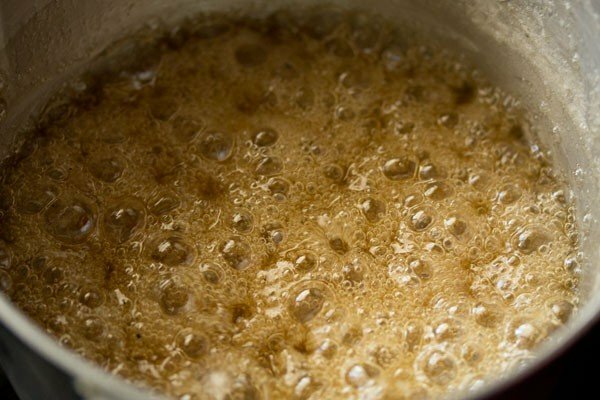 you can also use brown sugar instead of preparing the caramel solution. 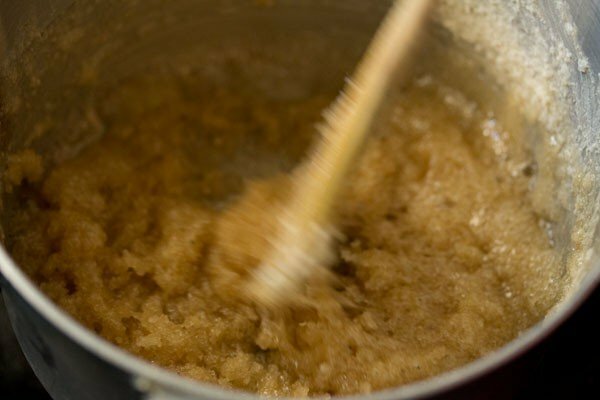 then just dissolve the brown sugar in 1 cup water and proceed to the next step – 18. 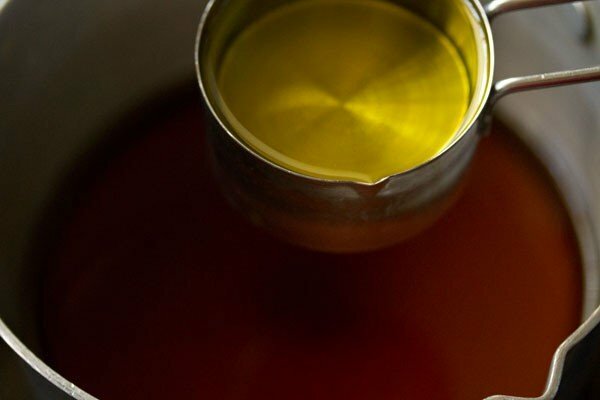 18. once the caramel solution has cooled down, add ⅓ cup oil. i used olive oil. you can also use sunflower oil or melted butter. 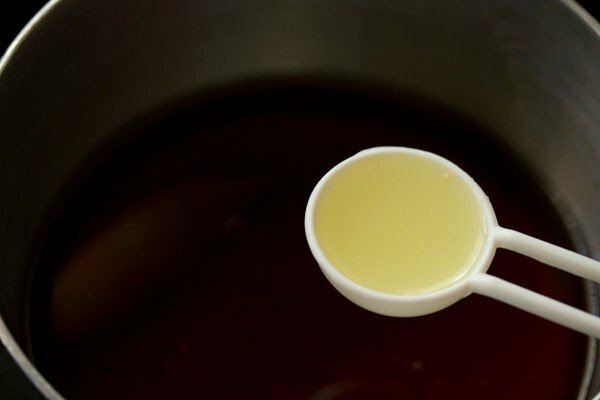 if using melted butter than add it when the caramel solution turns warm. 19. mix the oil with the caramel solution very well. 20. next add 1.5 tbsp lemon juice or apple cider vinegar. i used lemon juice. you can also use regular white vinegar. mix again very well. 21. grease an 8 inch round pan very well with oil or butter. also preheat the oven at 180 degrees celsius/356 degrees fahrenheit, 15 mins before you bake. 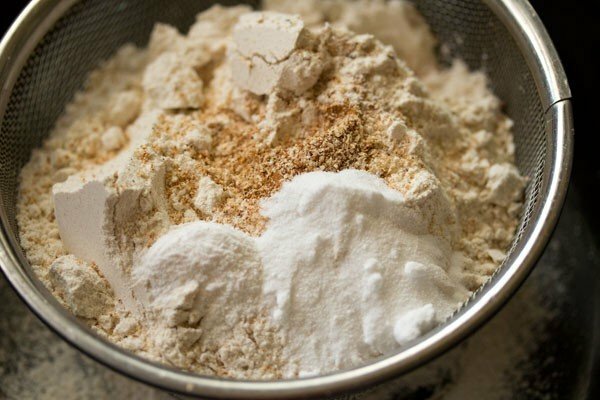 22. in a seive, take 2 cups whole wheat flour/atta (240 grams), 1 tsp baking soda, ½ tsp baking powder, ¼ tsp cinnamon powder, ¼ tsp nutmeg powder, ⅛ tsp clove powder and ½ tsp cardamom powder (optional). 23. sift all the dry ingredients. keep aside. 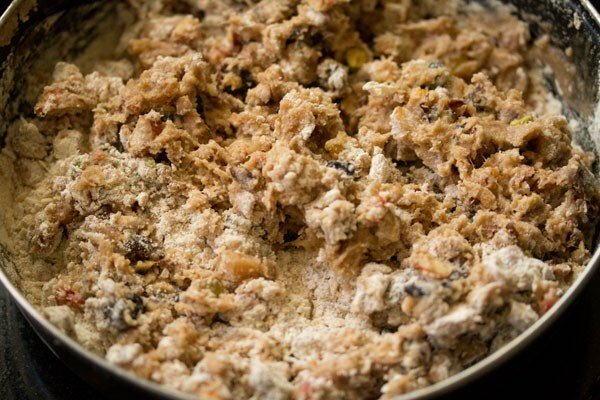 24. next add the soaked dry fruits + apple juice mixture to the sifted dry ingredients. 25. with a spatula just mix lightly. 26. add the caramel solution. 27. finish off the entire caramel solution in one go. 28. now fold the flour ingredients with the caramel solution. don’t mix. to see how folding is done, you can check this youtube video. 29. fold to a smooth batter. if the batter looks thick, then you can add some more water. 30. pour the batter in a prepared pan. gently shake and tap the pan so as to even out the batter. 31. place the pan in a preheated oven and bake the cake at 180 degrees celsius//356 degrees fahrenheit for 1 hour or 1 hour:15 minutes. the tooth pick should come out clean and dry when inserted in the cake. this cake has to be baked very well. if the top gets browned too much, then cover with an aluminium foil and bake. baking time varies with various brands and models of oven. so do keep a check. 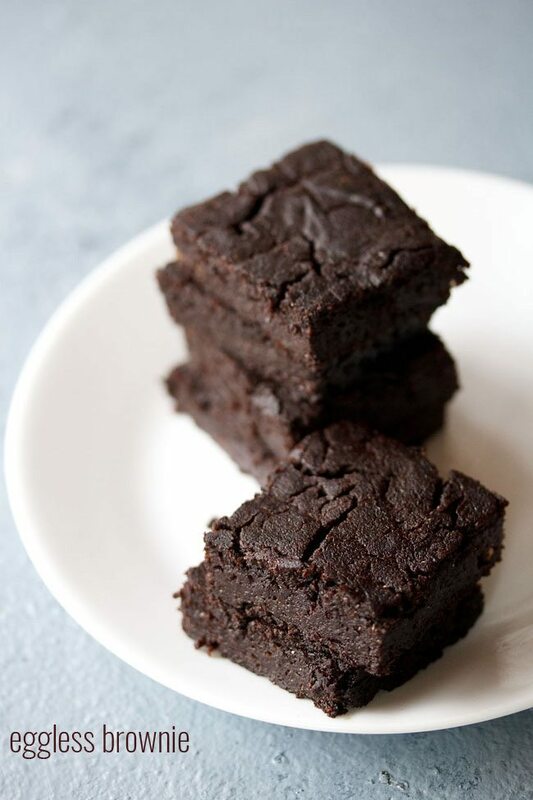 in case you remove the cake and find that it has not baked and has a sticky or too moist a texture, then keep the cake back in the pan and continue to bake. 32. here’s the base of the cake. i was in a hurry and while the cake was still hot, i removed it from the pan. result is a crack on the base. do remove the cake gently from the pan once it becomes warm or cools down. all the time, keep the pan while cooling on a baking rack. 33. you can sift some powdered sugar on top of the cake to hide the cracks on the top. 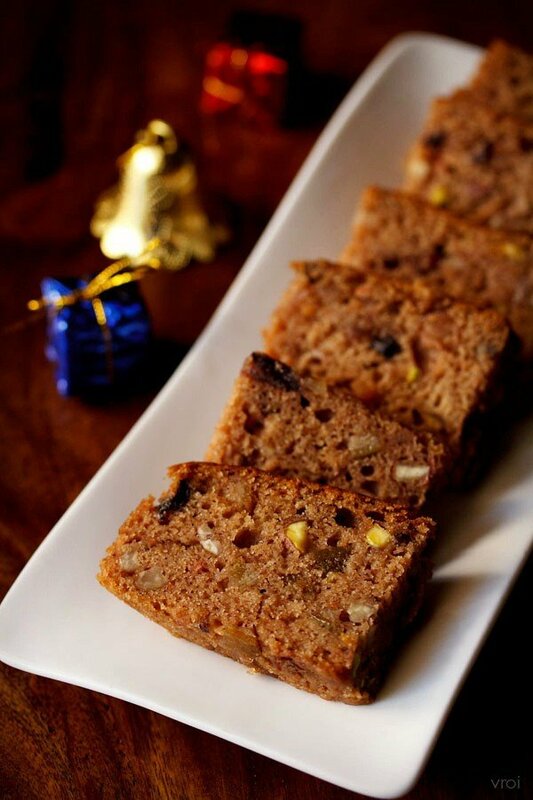 slice and serve the eggless fruit cake. the cake can also be refrigerated. it keeps good for 10 to 12 days in the fridge. i sliced the cake in slices and stored the slices in an airtight box. do not use fresh orange peels as cake will become bitter. instead you can use orange zest. orange zest is the orange part of the orange peel. using a grater or a zester, grate the orange part of the skin (peel) and not the white part. it gives a good aromatic orange flavor in the cake. you can use two to three oranges to get the zest. HI,if I have to halve the quantity,what is the pan size I need to take for baking the cake? ashwini, you can use a 6 to 6.5 inches diameter round pan. Hi , This turned out very well .Thanks for sharing such nice recipes and now able to make stuff which were thought to be impossible to make at home. welcome sumu. glad to know that recipes are helpful to learn such recipes. HI! THE RECIPE’S AMAZING. CAN U PLEASE TELL THAT IF WE CAN ALSO BAKE THIS CAKE IN THE MICROWAVE INSTEAD OF OVEN? thanks. 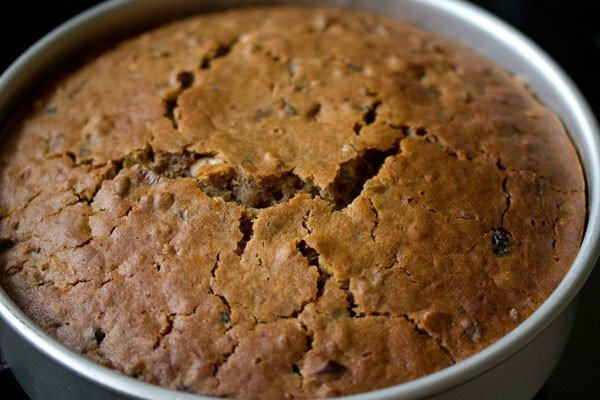 i am not sure if this fruit cake recipe can be made in the microwave oven. so i cannot say. Divya, was the grape juice bitter?. other than that i don’t see any other ingredient which will make the cake on bitter side. however i have not added grape juice in the recipe. I have made this fruit cake with orange juice and apple juice. is it necessarily to soak dry fruits over night?.. will couple of hrs do? shilpa, dry fruits really soak up well if soaked overnight. but you can even soak them for a few hours. Dear dassana….here instead of apple juice orange juice can b added na…means the juice which v get from fresh oranges?….should it b boiled?? ?also can the apple juice be replacedd by wine? shubha, orange juice from fresh oranges. 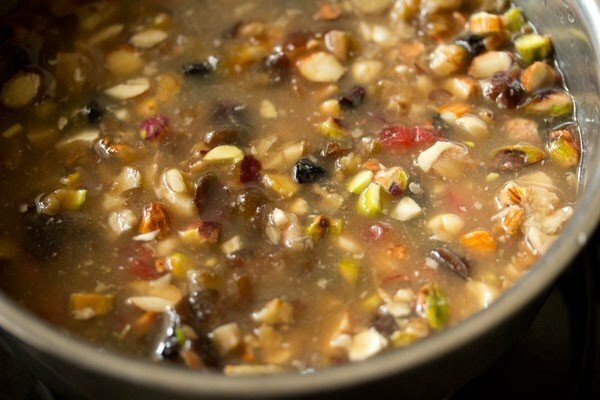 you can boil it also with the dry fruits. yes you can replace apple juice with wine. Thank u dassana…will try your recipe…. thanks a lot shubha. the cakes which become dense in fridge are the ones where butter is used. if oil is used, the cake does not become dense. it also depends on other ingredients used in the recipe. Thank you soooooooo much for this recipe. Tried it today and the result was a fabulously tasty cake! thanks purnima for this positive feedback. wish you too a happy christmas and a happy new year. Thank you so much for your valuable tips? archana, you can make cupcakes. temperature will be same that is 180 degrees celsius but time will reduce. so it can take 30 to 45 minutes. do note that a toothpick or a skewer should come out clean. you may see some stickiness on the toothpick due to the dry fruits like dates inside. but batter stickiness should not be there. 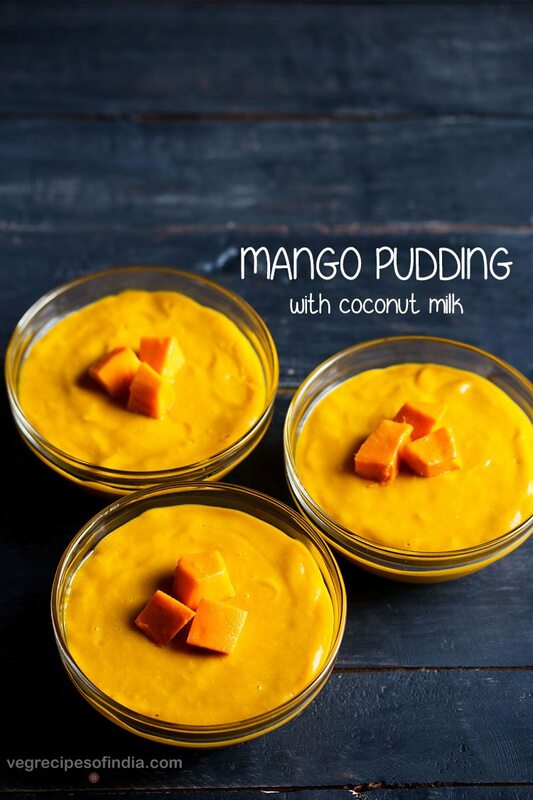 Hi dasanna, I m a fan of your recipes . I m going to try this cake . I have store bought 100% apple juice and I m going to bake thr cake on 24th December. Can I leave the dry fruits and nuts in apple juice for 10 days in fridge? prasy, do not keep for 10 days. the apple juice might get spoiled. just keep for a max of 2 days in the fridge. so you can keep the dry fruits soaking in the juice on 22nd dec or 23rd dec and then bake on 24th dec.
Great . Thank you Dasanna. ! in courier, my only concern would be that the cake should not crumble. firstly as this is an eggless cake and will be more prone to crumbling if its too much shaken and badly handled. its not a delicate cake, but compared with the egg based ones, it more on the softer side and not very firm. so i would not suggest to courier it. Hi, your cake looks so yummy! 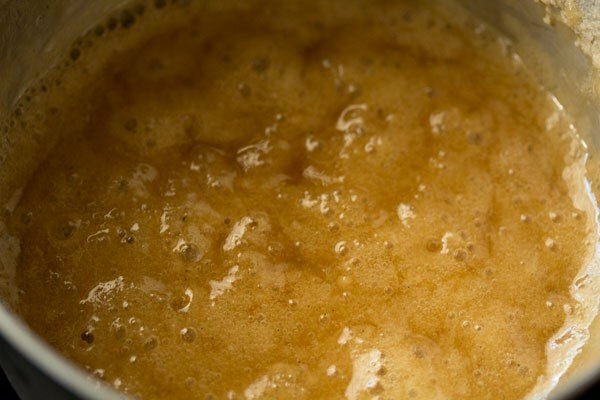 May I know if I can prepare the caramel a few days in advance? If pre-prepared, do I keep the caramel in fridge or just room temperature in airtight container? Thanks! thanks. you can prepare the caramel before. keep the caramel in the fridge in an air-tight jar. I did it yesterday. so yummy! and its really not too sweet. 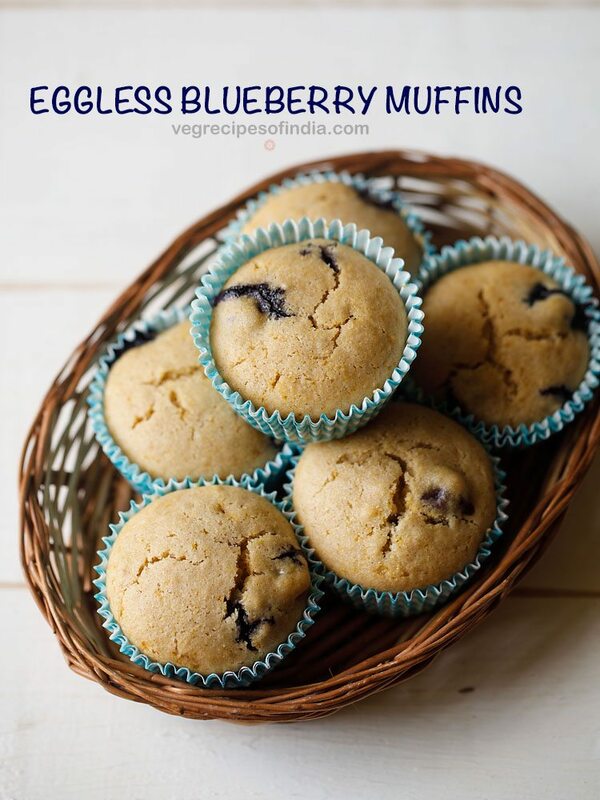 wholesome, light, and soft, but a bit on crumbly side… probably is my skill problem.. thanks for the great recipe! thanks for letting me know joyce. as you bake more, you will also learn more. its more about practicing and learning. then you can easily make good bakes at home. can I bake without oven ? 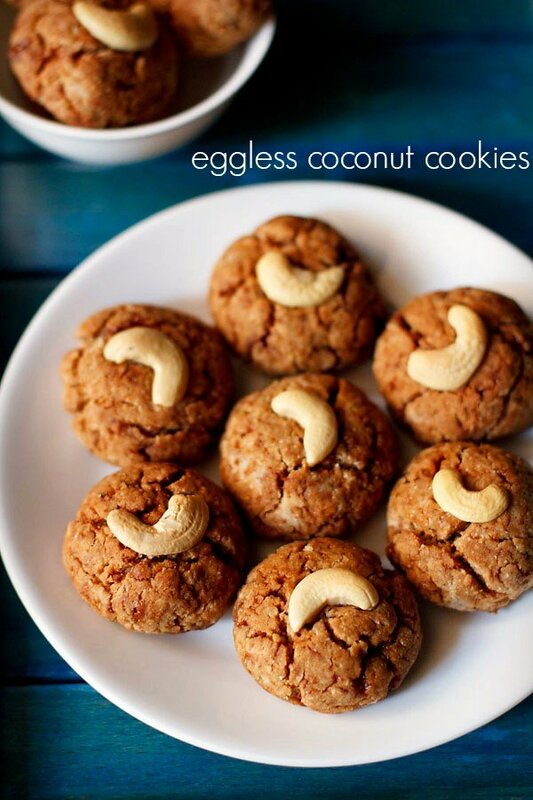 Thanks Amit for sharing this recipe. It is really useful. I find it healthy as it doesn’t use all purpose flour. Also I tried it yesterday and it turned awesome. I just added 3 ripped bananas and 2 tbsp pineapple juice too to make it more flavourful. wow ruby, addition of bananas and pineapple juice is so yum. thanks for sharing and also thanks for the feedback.